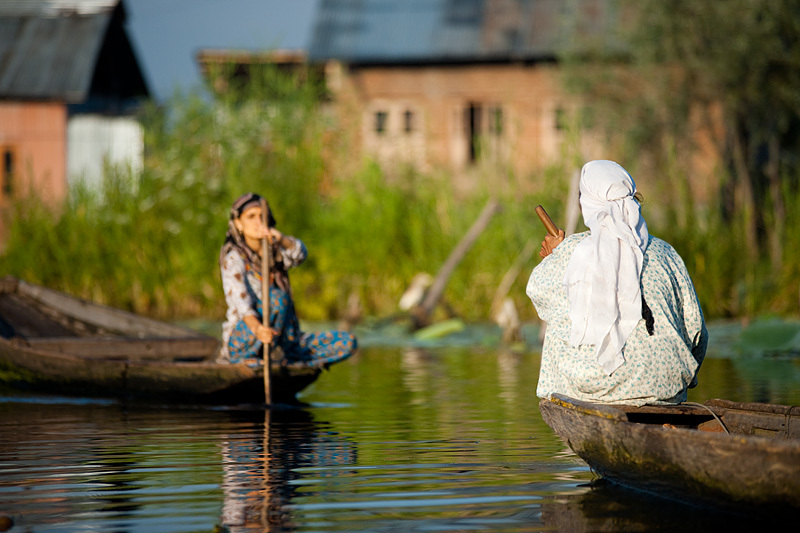 Two boating women approach one another on the back waterways of Dal Lake. 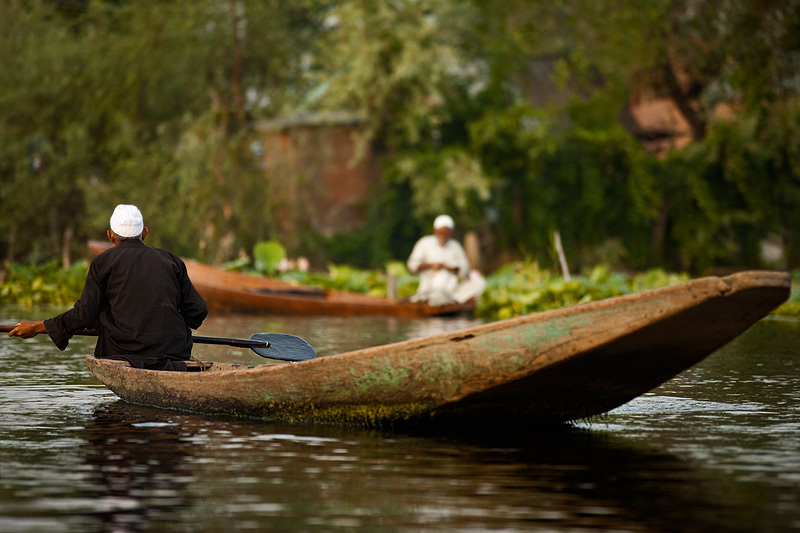 As part of their daily lives, Kashmiris live and work on the waters of Dal Lake. It serves multiple functions but none as important as transportation. Children learn early to deftly steer these rudderless flat-bottom boats, shaming foreigners like me who are quick to dismiss the apparent lack of difficulty. Archived photos (on the weekends) continues. As promised some weekends ago, the next several weekends will feature a trove of Kashmir photos I'd accidentally forgotten and recently uncovered. A moss-lined boat is driven past a stationary boatman on Dal Lake. After one of my three outings to the floating vegetable market on Dal Lake, I took the opportunity to poke around the back waterways of the lake. Brick houses (seen in the background of this photo) appeared to be built on patches of floating vegetation in the middle of Dal Lake and local neighborhoods seemed to thrive in every corner of the lake. One of the first things that struck me was the Kashmiris' dependence on the lake. Quickly thereafter, it was hard not to notice the abuse of these very waters on which the locals are so reliant. Peering into the water's depths, mounds of trash laid piled from years of neglected cleanup. Kashmiris claim to be entirely different from Indians; However, in one way, the two peoples are wholly identical. 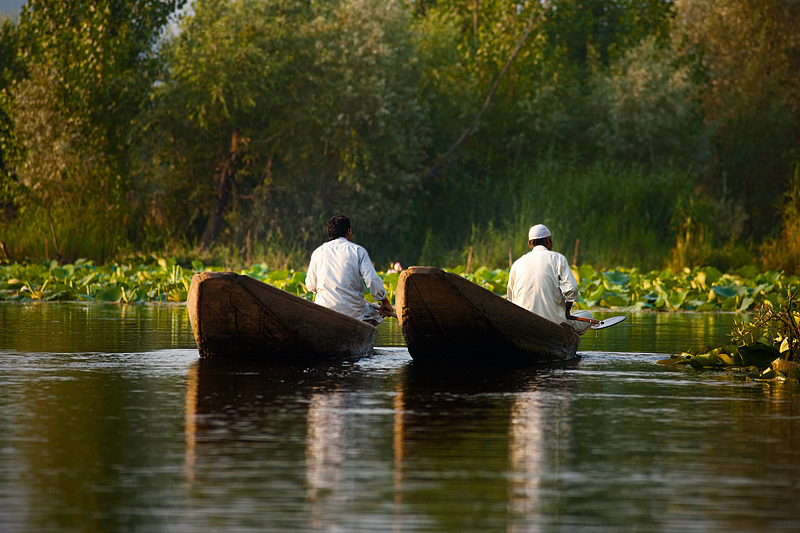 Two Kashmiri men boat in tandem on the backwaters of Dal Lake. Demonstrated in all of the photos above is the front-loaded method of boating. I found it exponentially more difficult to steer using this method, preferring to sit and paddle from the rear instead. Most Kashmiris seemed to prefer the front, indicating some technical advantage that I'm currently ignorant of. I love your low angle, and shallow DOF. Great work as always.